Stuck. It’s a familiar place. We all end up there at one time or another. A fair amount of my coaching work is with people who know they need to take that next career step, and yet they are stuck in a job where they are not happy. Note that I didn’t say unhappy—though some of my clients are there, too—but rather something less insidious. They feel unfilled; caught in too small a pond to grow and develop new skills. And therein often lies the problem. Because they aren’t doing whatever it is that the job they want does, they feel they can’t possibly get such a job. That’s the same as fundraisers who decide that they won’t ask someone for a gift because they “know” the person will not say yes. Getting a yes, of course, actually isn’t the most important thing in either fundraising or job seeking. Life, particularly our lives as fundraisers, is a whole lot about numbers. You do have to ask enough people before you get a yes. But the process itself offers much. For jobseekers, it gets you out there—learning about the realities of other jobs, other places, and letting others learn about you. It’s also a terrific way to stretch. Don’t, I tell my clients, only apply for jobs that you already are doing—in fact, why apply for those jobs at all? Stretch upward. Reach to that next job—the one your current job should be training you for. A resume and cover letter, I opine, is not to tell someone what you do and that you are applying for the advertised job. It is to show a potential employer what you can bring to the table and how what you do can be translated into an asset for them. 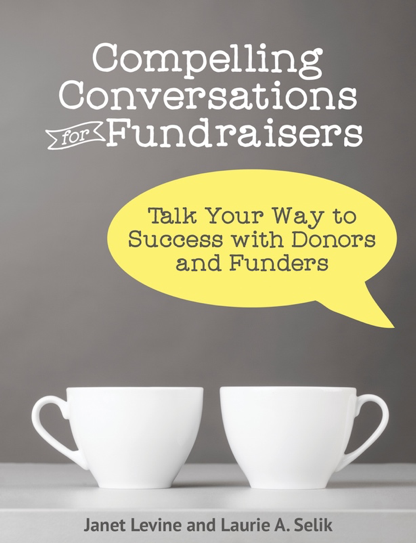 Likewise, you don’t only want to ask donors for what they’ve done…you want to help them grow and stretch, and make a gift that will be significant (for them and for you). The case you make, therefore—like your resume and cover letter—should not be telling them what they already know. It should be showing them how they can make a difference. Applying for a job, I explain to my clients, doesn’t mean you will get an interview. In fact, the odds are against that. But if you don’t apply, you can be assured that the interview will not ever happen. An interview doesn’t mean that you will go to the next level—though the odds are greater than they were just to get that first step. Second interviews usually mean you are one of three candidates—so your changes are not bad, but by no means a guarantee of a job offer. And, for those who worry that they should only apply for a job they are “sure” they want—I say, (1) how will you know you want it until you spend time with the people with whom you will work and (2) an offer does not mean you must say yes. Likewise, asking for an appointment, does not ensure you get one, nor does getting an appointment mean that the person will want to move forward toward making the gift. But the closer you get—and every agreement to meet brings you closer—the more likely a gift becomes. Don’t get stuck in the place where you are—whether that place be in a job or in fundraising. Reach up to the next rung—or the one above that. Dare to ask for more than you think you can get, but give a reason why you should get what you ask for. Above all, don’t decide what others will want—give them reasons to want what you are asking for. Janet Levine works with nonprofits and educational organizations, helping them to increase fundraising capacity. She also works with individuals, helping them to reach for the stars. Learn more at http://janetlevineconsulting. While there, sign up for the free newsletter. This entry was posted in Ask, fundraising, job search and tagged Ask, coaching, development, development directors, fundraising, job search. Bookmark the permalink.